Time Present and Time Past: The Shattered Idols of Prehistoric Brittany - Europe's First Iconoclasm? The Shattered Idols of Prehistoric Brittany - Europe's First Iconoclasm? 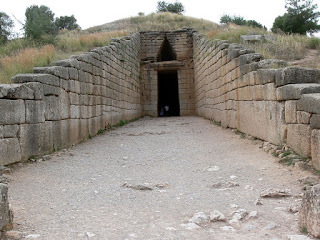 For much of the Twentieth Century, archaeologists believed that the passage graves of Atlantic Europe had been built around 3-3500 years ago, inspired by the "mastaba" tombs of ancient Egypt, and by monuments such as the "Treasury of Atreus" (actually a tomb rather than a treasury) in Mycenean Greece. 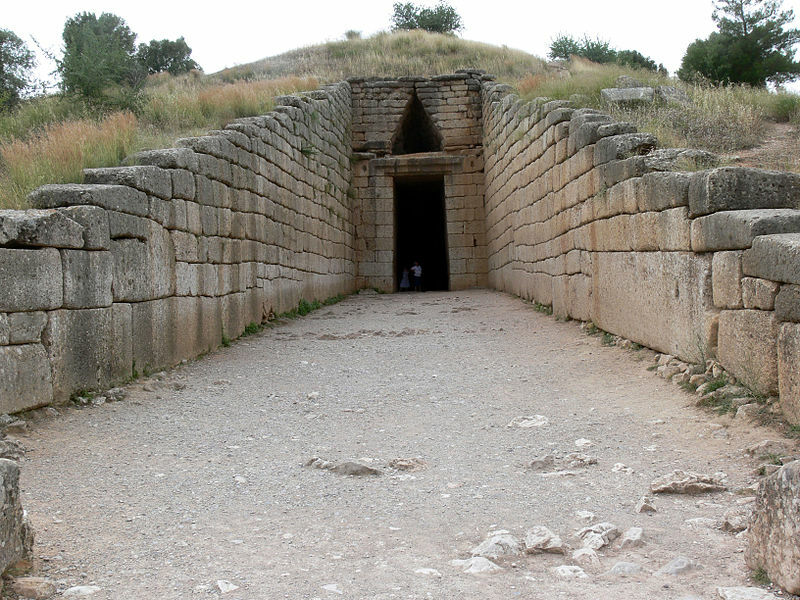 The "Treasury of Atreus" at Mycenae, a Bronze Age tomb of c1250 BC. Photo: Fingalo (licensed under CCA). When radiocarbon dating was first developed in the late 1940s by the American scientist, Willard Libby, these assumptions seemed to be confirmed. Twenty years later, however, when the technique was refined by reference to tree-rings, the archaeological world was shocked. Many of these monuments were shown to be much older than had previously been thought. Analysis of charcoal from the passage grave of Kercado, in Brittany, suggested that it had been built between 5200 and 4360 BC, at least 3000 years earlier than the Treasury of Atreus. 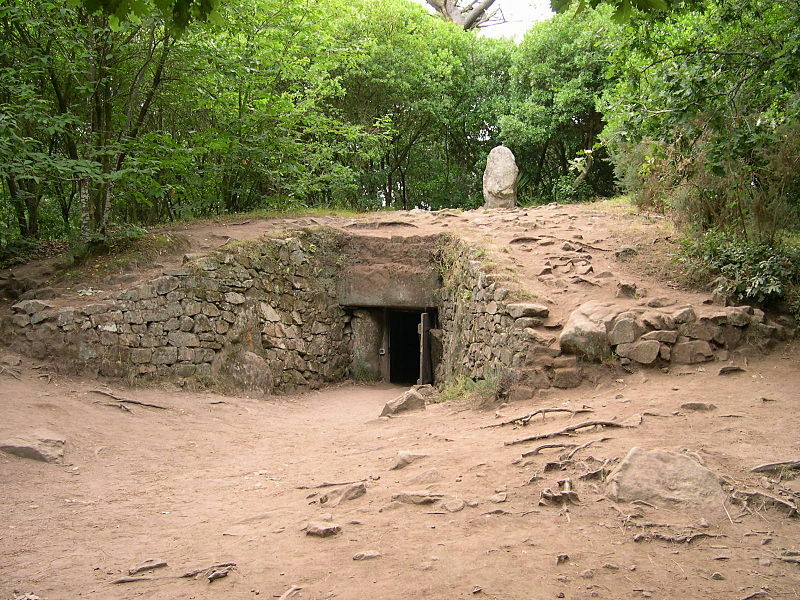 The passage grave of Kercado, once thought to be an imitation of the Treasury of Atreus, now understood to be at least 3000 years earlier. Photo: Binche (licensed under CCA). The Kercado date is now recognised as a very imprecise one, and the most recent research suggests that the earliest European passage graves were built in the late 5th, rather than the 6th Millennium BC, but this, nonetheless, rules out any possibility that they were inspired by any prototypes in the Mediterranean world. 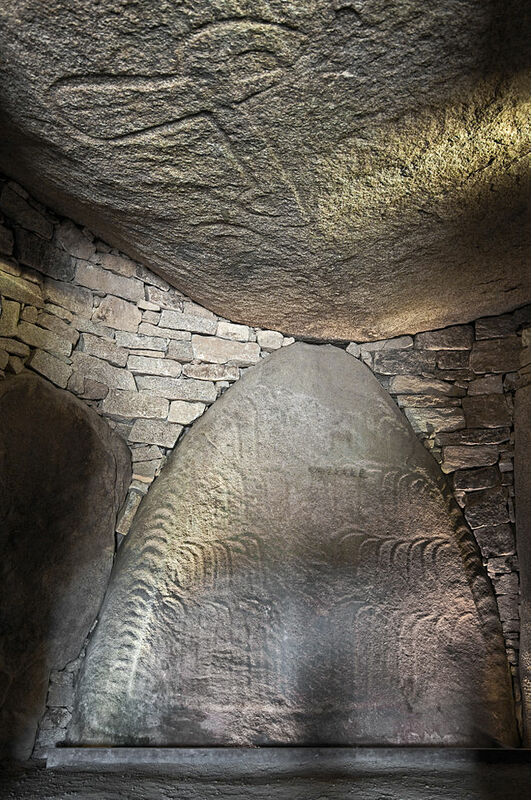 A further shock came in 1983, when my late friend and colleague, Professor Jean L'Helgouac'h, published a paper in which he demonstrated that several of these passage graves incorporated the shattered remnants of a yet earlier phase of megalithic activity. At Locmariaquer, on the western shores of the Golfe du Morbihan, there had once been an alignment of standing stones carved with symbols, including images of stone axes. 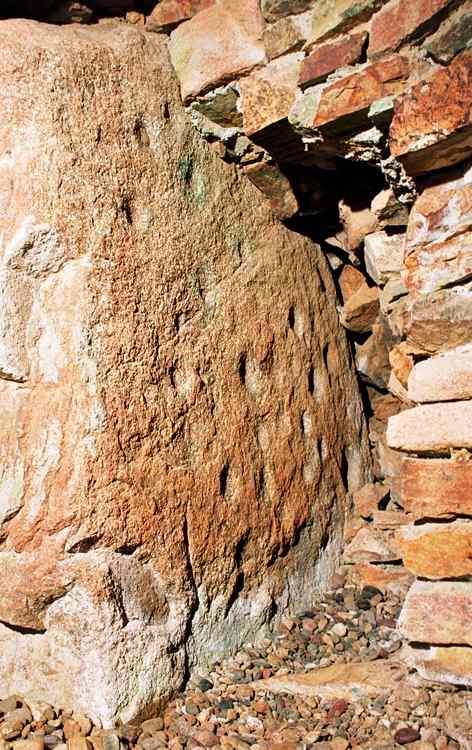 One of these is still standing, but has been incorporated as the back-stone of the passage grave of La Table des Marchand. The carved back-stone and capstone of La Table des Marchand, Locmariaquer. Photo: Myrabella (licensed under CCA). Another, the largest of all stones ever raised by prehistoric people anywhere in the world, lies broken in four pieces nearby. This was originally more than 20 metres high, with a weight of 280 tonnes. It seems to have been raised around 4700 BC, and to have fallen around seven hundred years later, probably as the result of an earthquake. The "Great Broken Menhir" of Locmariaquer. Photo: Louis Carlier (licensed under GNU). Another stone, carved with images of a hafted axe, a bull, a goat and an enigmatic symbol, was broken into three pieces, each of which has been incorporated in a different monument (La Table des Marchand, Gavrinis and Er Grah). Yet another is incorporated as a capstone of the nearby passage grave of Mane-Rutual. 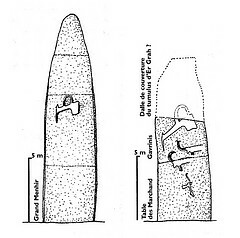 Reconstruction of the "Great Broken Menhir" (left) and its companion, the fragments of which are now incorporated in three separate monuments. The hafted axe on the lower fragment of the stone on the right is the one that can be seen on the capstone of La Table des Marchand above. Image: Professor Jean L'Helgouac'h. These stones were erected by some of the earliest farmers in Europe, and the symbolism of the one shown above seems to encapsulate the new agricultural way of life. Whilst the largest of the stones may have been felled by an earthquake, the others seem to have been deliberately smashed and reused. Was the earthquake itself seen as a portentous omen, prompting the first of many waves of iconoclasm in Europe? This iconoclasm, however, was not limited to the south of Brittany. 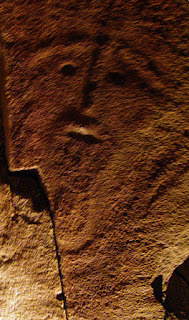 As L'Helgouac'h and his colleague, Serge Cassen, showed me around their excavations at Locmariaquer in the late summer of 1988, and as we later shared a bottle of Muscadet, I realised not only that the first European megaliths must have been built more than five centuries earlier than any of my tutors at Cambridge had dared to imagine, but also that I knew of other examples of shattered idols incorporated in later passage graves: the "cup-marks" of La Hougue Bie on Jersey (a site that I would go on to excavate myself, with the help of L'Helgouac'h's students, as well as my own), and the so-called "Guardian" of Le Dehus on Guernsey. The "cup-marks" of La Hougue Bie. 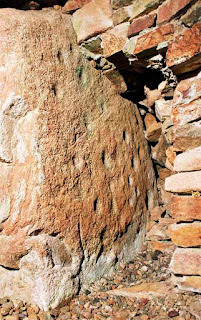 This is the stone on which Tubal sits, in my novel, Omphalos, before Txeru and Egraste go on to build the passage grave. Photo: www.megalithics.com. The "Guardian" of Le Dehus, Guernsey. The site is visited by Amzai and Nanti, in my novel, Undreamed Shores, although they don't see the carving, because Nanti is afraid to enter the passage grave. 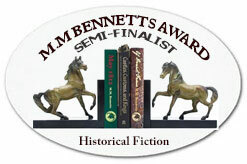 Photo: Temp Wingas (image is in the Public Domain). What I did not know, however, on that most memorable of days, was that I would go on to write novels in which the builders of these monuments would feature as characters: novels which, sadly, my friend, Jean L'Helgouac'h, would not live long enough to read.